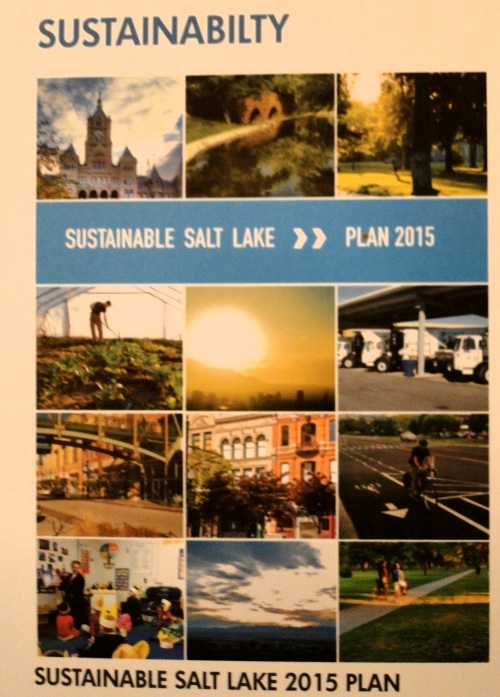 The International Making Cities Livable conference featured presentations by three mayors from three very different cities: Salt Lake City, Utah; Carmel, Indiana; and Freiburg, Germany. After hearing them, I'm primed for visiting all three of their hometowns! 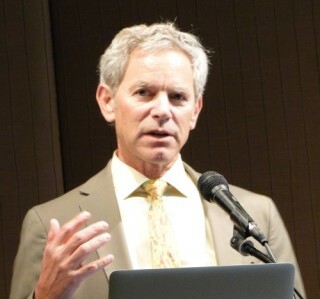 Salt Lake City Mayor Ralph Becker. photo by Wayne Senville. Ralph Becker was elected Salt Lake City's mayor in 2007 after spending 11 years in the Utah Legislature. Becker, who is also a planner (FAICP) and a lawyer, explained that in his first year in office "we did a synopsis of all city codes and what was in the way of our being a truly sustainable and livable city." The code review project -- which was led by Chris Duerksen of Clarion Associates -- was "tedious, difficult work." But, he continued, "it identified over 300 specific changes we needed to our city codes." The project also showed, Becker said, that "the everyday things we do in the city" can be more important and have a greater impact on residents than a dramatic, high profile project. In some cases "we needed to just get out of the way of the good things people want to do." One example he pointed to: urban agriculture. "Incrementally our zoning made this more and more difficult. We had all sorts of restrictive provisions, such as prohibiting greenhouses because of accessory structure limitations, or not allowing portable community gardens on vacant lots, a great temporary use." the return of streetcars -- to go along with the 150 miles of light rail built in the region over the past decade. 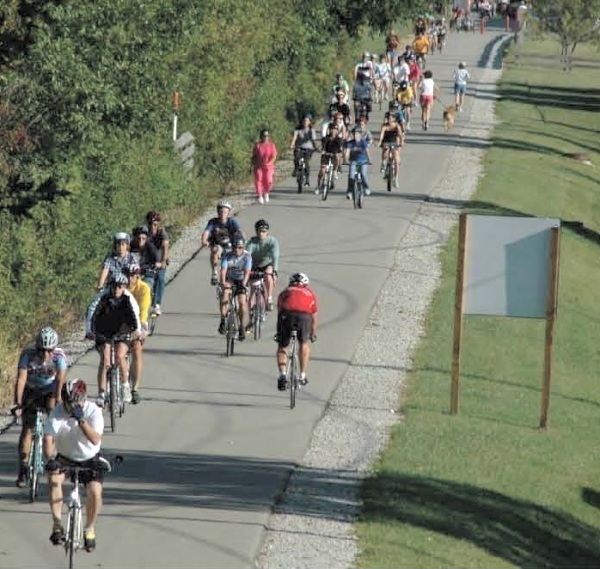 reestablishing neighborhood commercial centers, to provide easier access by bike or on foot. Market in Salt Lake City's 15th and 15th neighborhood commercial area. photo by LivingLandscapeArchitecture; Flickr creative commons. Mayor James Brainard. photo by Wayne Senville. 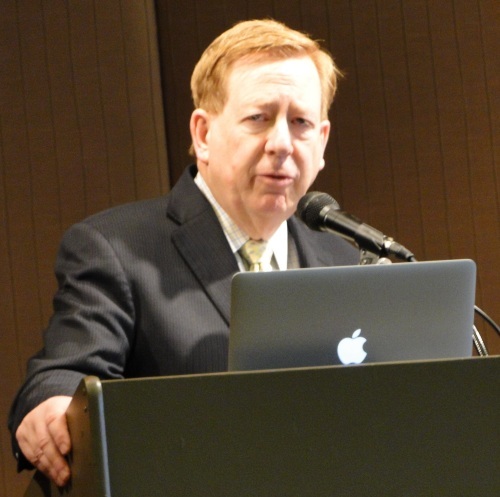 James Brainard is Mayor of a growing suburb of Indianapolis. In fact, it's the fastest growing city in Indiana Its current population is over 81,000 (up from 25,000 in 1990 and 38,000 in 2000) -- and Mayor Brainard expects the city to reach 125,000 to 200,000 by 2050. Speaking after Mayor Becker, Brainard told the audience that you don't have to have to live in an area of great natural beauty, like Salt Lake City, to have a great city. 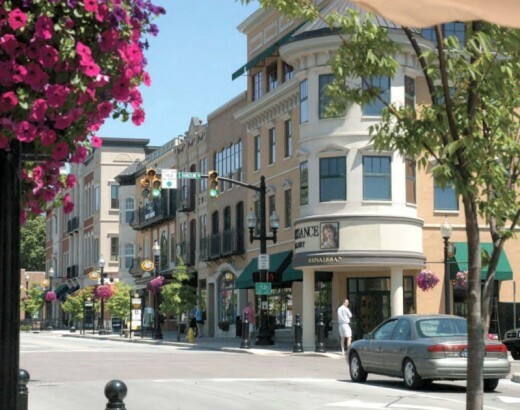 And turning Carmel into a great city is what Brainard's been striving for in his 18 years as mayor. One of the cornerstone of his administration was the idea of "building a real city center." Our palette in central Indiana: a flat plain, no water, no mountains, no beaches ... and winter. So what, that's similar to Paris, France (though they do have a small river). But Paris focused on its built environment. So we have to pay particular attention to architecture, since we don't have many natural amenities. When I took office we had a small, four block, little Main Street that was in bad shape. We also recognized it wasn't large enough to serve as a downtown for our eventual build out population. So we turned this area into arts and design district. 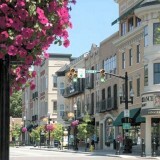 We started to do a series of public-private partnerships for development of a Main Street arts and design district. For our first public-private project, the City bought land and discounted it to a developer. But we told the developer what we wanted -- we wanted the buildings up to the street, with apartments over retail. The apartments were filled within weeks. The four to five block Main Street area has been totally transformed. Carmel's Main Street has been transformed into an arts & design district, with mixed-use developments. Photos from Mayor Brainard's IMCL presentation, unless otherwise noted. We spend two percent of city's annual revenues on supporting the arts. We now have over 20 pieces of public art. But we were also worried about gentrification and the impact this would have on the artists we were trying to attract. We wanted to get some equity in the hands of the small art gallery owners. In our agreements with developers, we said we'd help you with this project (in terms of infrastructure, and discounted land pricing), but in return you have to sell 80 percent of the storefronts to the individual owners, often small family-owned businesses. There are now 66 arts and design businesses in our district -- 45 in a new design center that replaced a liquor store. 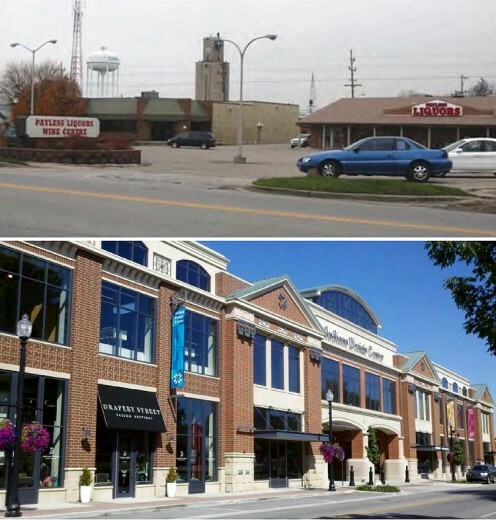 Before and after photos of the Indiana Design Center in Carmel. It houses 45 design-related businesses. We put underground parking in, paid from out of the taxes for the new building. For our new downtown, we went four blocks to the south where there was an abandoned strip center. Our redevelopment commission bought about 100 acres in this area, and we then did a master plan for it. Since then, we've had over half a billion dollars of public and private money invested in our new city center. We didn't want to design for the auto, though we knew we needed to accommodate cars. We wanted to design for people. So we've built part of the city center over a parking deck. We also started to build public spaces, and now have six squares in our city center. The results: we now have over 700 people living in our city center, and hundreds of others working there. It has become a community unlike what you'd have in a traditional suburb that's disconnected. And we're planning on 11 more buildings in our city center. We want mixed-use, without zoning. We don't care what people do in the buildings, but we do care how the buildings look and feel. We also asked ourselves whether we could build a regional amenity not provided by Indianapolis that could also be a draw for our city center. 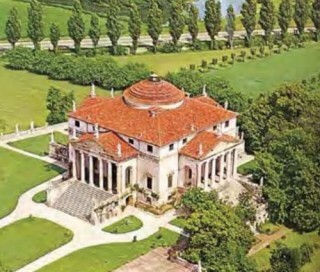 We realized there was no dedicated concert hall designed for music. So we decided to build a 1,600 seat concert hall. We looked to Europe for design ideas. 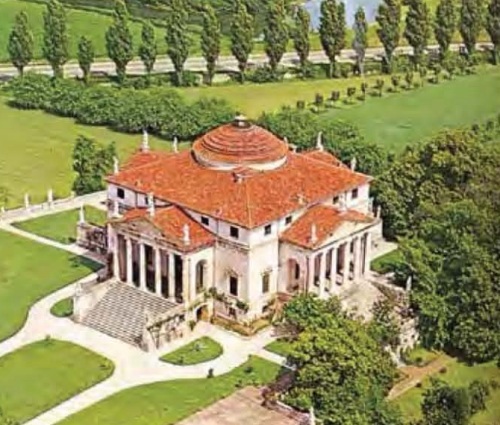 Our concert hall is inspired by the Villa Rotunda in the town of Vincenza, just outside of Venice (photo on left). 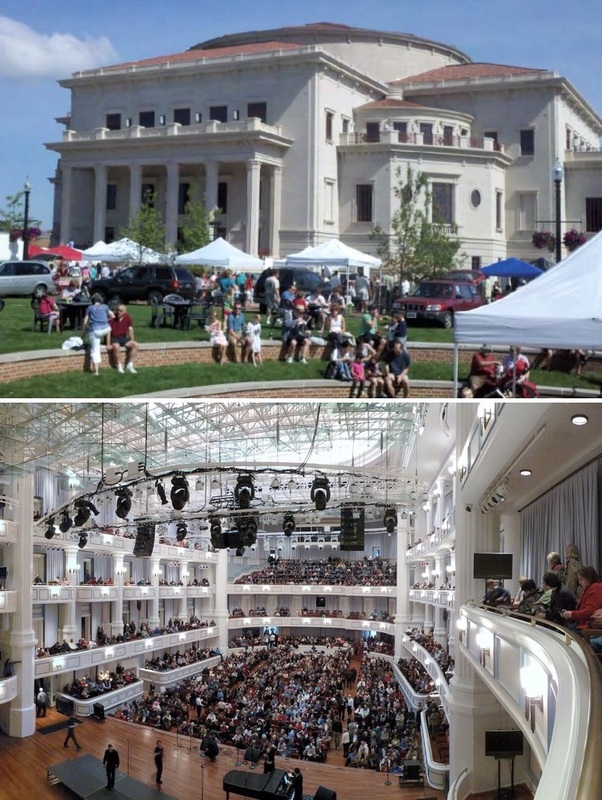 Carmel, Indiana's concert hall. Interior photo by Jason Pearce, Flickr creative commons license. 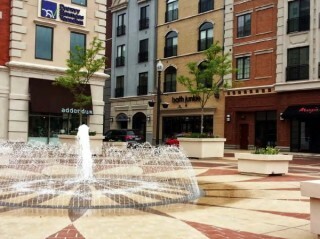 We used local materials, Indiana limestone, and tiles from a Cincinnati manufacturer. We also created our city market next to this building, which attracts 4,000 people every market day. Also very important has been development of a trail which connects our city center with our arts and design district, and also goes on to Indianapolis. On a nice summer day 10,000 people use the trail. Trail connecting points in Carmel to Indianapolis. We think our plans are working. Last March, Money magazine named us as best city in our population range. Do you see why I want to visit Carmel? Mayor Sven von Ungern-Sternberg is also passionate about his community. Freiburg is a city of about 220,000 in the Upper Rhine Valley in the southwest corner of Germany. It's "often considered the ecological capital of Germany," he said. That point was made clear as Ungern-Sternberg told conference attendees about two new "suburban towns" within Freiburg. Let me highlight some of his comments about one of the two towns, Rieselfeld. 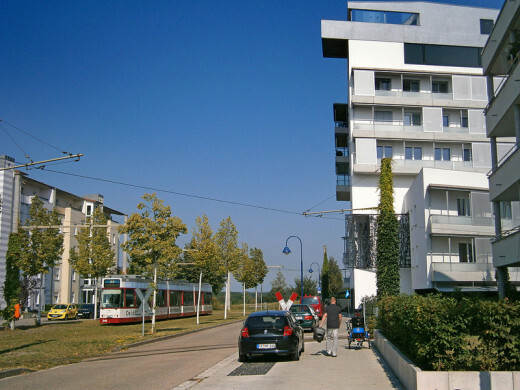 The first step in Rieselfeld's development, before any housing was built, was extension of the city's streetcar line. In fact, the streetcar's first users were the construction workers coming to work on the development. It's very important to have this transportation infrastructure in place first, the Mayor told us, so it will be there when the first residents move in, and "they will immediately be used to using it." 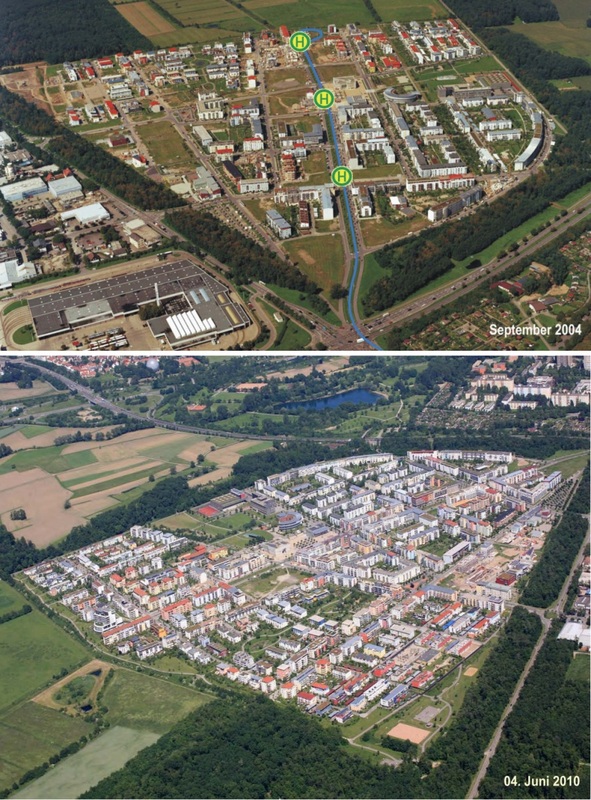 Two aerial photos show the pace of development in Rieselfeld between 2004 and 2010. In the earlier photo, the location of the streetcar stops are highlighted. 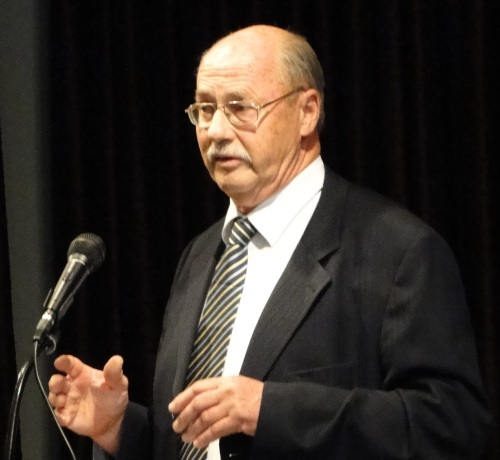 All images are from Mayor Sven von Ungern-Sternberg's conference presentation. The streetcar line provides the "backbone" for the new community, as Ungern-Sternberg put it. But, he stressed, you have to have a high enough density to support this kind of infrastructure. Retail is built with housing above along the main roadway, where the streetcar runs in a grassy median. Housing is a maximum of five floors high, which, the Mayor noted, provides a more human scale. The housing has courtyards, with the parking underground. This way, he said, small kids can play in the courtyards within visual oversight of adults. The new high school is also located in the middle of Rieslfeld. In hearing Ungern-Sternberg speak, he's talking about an approach to development not all that different from what I saw at Hillsboro, Oregon's Orenco Station. In both, access to transit is a cornerstone, complemented by mixed-use development (providing retail space along the ground floor of the main roadways) at relatively high densities. The tram in Riselfeld. Photo by Lieven Sotte, Flickr creative commons license. Parking is generally kept out of the way, often under the housing. Ample provision is made for open space, providing both nearby play areas for children, while also moderating the crowded feeling you might otherwise have from the high density of development. 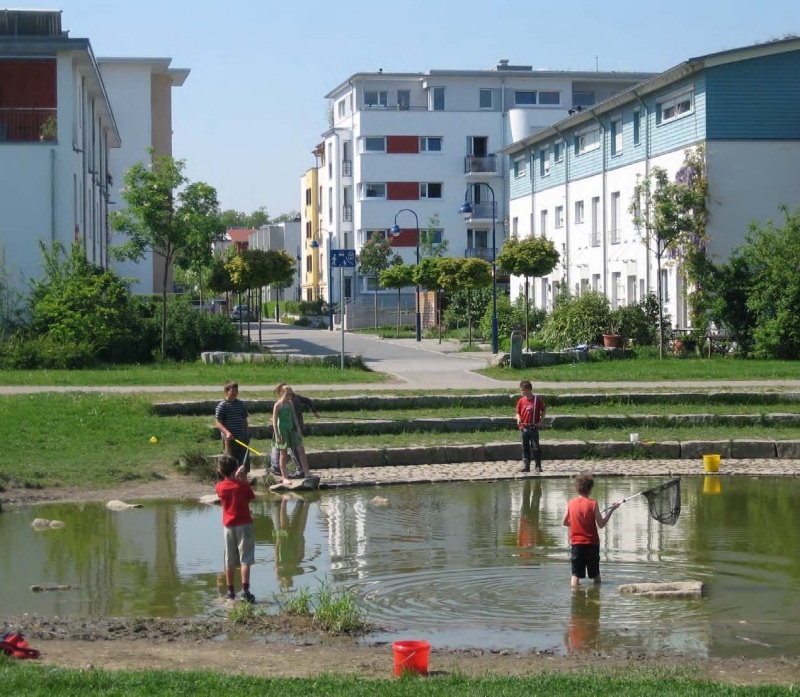 Is this the template other newly developing suburbs will follow, not just in Germany and Oregon?